"Rebirth" quilt has been done. 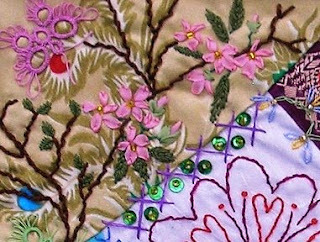 As I wrote before the center piece is cross stitched by using a pattern from Kathy Shaw's blog. 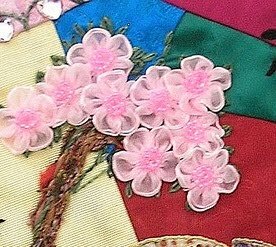 I've realized there are so many embellishing of cherry blossoms on Sendai Quilts. It must be a symbol of Japan for oversea people. This spring we could hardly enjoyed the cherry blossoms. We had hardly had time to do it. So isn't it nice we have another chance now? There might be more cherry blossoms I've missed. 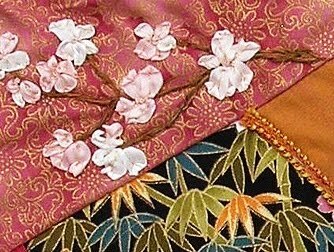 Sendai quilts arrived here safely and we opened the box two days ago. All quilts were beautiful far beyond our imagination. The photos never did justice. We were sure how much Japanese people would admire them for it must be first time for most of them to see real crazy quilts in person. We are realy looking foward to the event now. They are treasures. But today I received another treasure. It was from Lauri Burgesser I met in Colorado retreat last year. When I found a lovely cqed bear in the box and read a letter from her, I was almost crying. She remembered how I missed her bear stolen by Josie in Cninese auction. After the quake and tsunami, she asked all the ladies who attended the retreat with me, to contribute something small for the bear. Lauri put it all together for me. All their names are on the bear. She wrote to me, "We hope that this bear will bring back fond memries. Please know that all of us are thinking of you and wishing you and your country a speedy recovery!!" How much I appreciate everything from all those ladies. Thank you very much for your thoughts, friendships and loves. Lauri, heartful thanks for your sweetness!! The lovely bear is my treasure. It's just my own! !